Previously I talked on making a “third choice” when the only immediate options seem to you too evil. You have heard it said that if you vote for Z candidate (not of the two main parties), then you are giving a vote to Y candidate (not the X candidate the speaker wants you to vote for). But I say unto you, when you endorse a fella, you’re endorsing that fella. 2) It presupposes that Christians should be unified in voting for Mitt Romney. 3) It presupposes that Christians should participate in democracy purely on pragmatic terms, and not on principle. 4) It presupposes that Romney actually would end up being a “lesser evil” than Obama. 5) It presupposes that everything you learned about math since you were a child is wrong. 7) It presupposes that those who vote for Ron Paul are acting against the (alleged) unity of Christians, not to mention against some invisible edict from God to vote for Romney. So if I am choosing to vote for Ron Paul, am I therefore acting against the illusion of unity in favor of principle? Is being unified over mediocrity more important than suffering through a transitory loss because we stood for a principle? Again, I am asking these questions not to those who see Obama or Romney as a fit candidate, but to those who merely want to choose a “lesser evil”, only to turn around and wag a finger at those who do not like that idea. If you are choosing to vote for Romney or Obama on grounds other than “he’s not as bad as the other”, I will at least respect your integrity of conscience, although I hope to challenge you to reconsider within the posts that follow. But if you want to wag a finger at me for not following a bandwagon you yourself don’t even believe in, I feel you have no room to talk. “When All Else Fails, Blame the Paulbots”. If Romney has enough money to finance any campaign he wants, and Obama is really that bad, why do you need Ron Paul voters so badly? And why won’t they let go? Why aren’t they following easy power and money? You see, it can also be argued that if you vote for Romney, you are giving a vote to Obama. Not Obama the man, but Obama the policies. Because between the three men we have discussed thus far, guess which two are most alike. In Tampa Ron Paul supporters were not given fair treatment. Numerous excuses were made to disqualify them from nominating Congressman Paul. In other words, the GOP wanted a fixed election. But you can’t blame them for being consistent. It’s the same way America teaches people to vote in countries we invade and rebuild. Supporters of Romney stooped to dishonest means in order to isolate Ron Paul supporters, thus causing division, rather than giving them a fair shot, which had potential to unite people under an alternative ideal to the failed ideals the GOP had been clinging to for years. So if the finger of blame for lack of unity should be pointed at anyone, it should be at Romney, not Paul. Before I present my ideological case for voting Ron Paul, I want to offer another illustration to help open you up to thinking about “third way” options. Suppose I have an apple I’d like to give away, and Schmitty and Brock both want the apple. Now, they’ve already had an apple. Along comes Wren. He hasn’t had an apple yet. He asks politely. Schmitty and Brock are each arguing over who gets the apple, making up lies about one another in order to make me favor one over the other. Wren just tells you straight up that he would like to have it, and that he believes he is the right person to have it because Schmitty and Brock have already had an apple. So I’m about to decide to give my extra apple to Wren. But then I’m told that not only are Schmitty and Brock liars, they are also big bullies. They fully intend to take the apple from Wren once I give it to him. I know that no matter what, if I give my apple to Wren it will be taken from him by one of these two bullies. So then I think that if no matter what I do, the apple will end up with Schmitty or Brock, I should then probably give it to the slightly nicer bully, that way at least the bigger bully isn’t getting it. Whoever that is, once I determine that I will act based on it. See, if Schmitty is the bigger bully, I should give the apple to Brock becuase if I give it to Wren, Schmitty will just take it from him. If Brock is the bigger bully, I should give the apple to Schmitty becuase if I give it to Wren Brock will just take it from him. After all, if I can’t do anything about the hungrier boy, and therefore boy more worthy, getting the apple, I should at least give the apple to the next person in line, rather than let the bigger bully have it. This is what you call pragmatism devoid of principle or ideal. I believe it is highly important that I give my apple to Wren no matter what. If my conscience tells me he is the most worthy of that apple, even if there’s no way he’ll be able to keep it, I must still give it to him. Wren won’t get to keep the apple? 1)I need to see it happen because I need to act on what I believe should be so, I need for my actions and beliefs to be as unified as possible, and I need to build my own strength and faith in what I believe is good. 2)Schmitty and Brock need to see it happen because they need to see me make this gesture and learn from it, even if they are both inclined to take the apple away. They need at least that one time in which they see me make this decision, to see what it represents and why I did it. 3) Wren needs to see it happen because he needs to know I believe he is worthy of the apple. He needs to know there is someone who wants to give him this apple. He needs to know that there is at least a chance at hope, even if people sometimes takes it away from him. He needs to know that I stand for him. 4) And of course everyone else around needs to see it happen. You need to see examples of people clinging to hopeless odds as a gesture of an ideal they believe in, rather than giving into a machine they no longer believe in. I feel that even if you lose, you need to play fair. You need a remnant. To give an apple to Wren means to give an apple to Wren, not the stronger bully who will take it from him. If you need to reread this, all you have to do is scroll up to the top. I am aware of the weaknesses of the above illustration. It is not meant to be directly allegorized. However, Romney has engaged in verbal class warfare “bullying”, and Obama has engaged in passive aggressive diplomatic “bullying”. They also both lie in their ads quite frequently. They both support increasingly dictatorial laws. I know an apple, being food, is not comparable to a vote for leadership. But I use this elementary model of children and food to teach a principle about how pragmatism is dead without idealism, that the two must coexist in the mind of a person with a healthy conscience. In order to understand the decision we make in the apple scenario, we must look at the bigger picture of what the gesture means, not just figuring who will end up with the apple today. Because if our gestures are powerful enough and relentless enough they can shift the power away from the bullies. The apples will be more fairly distributed, so to speak. 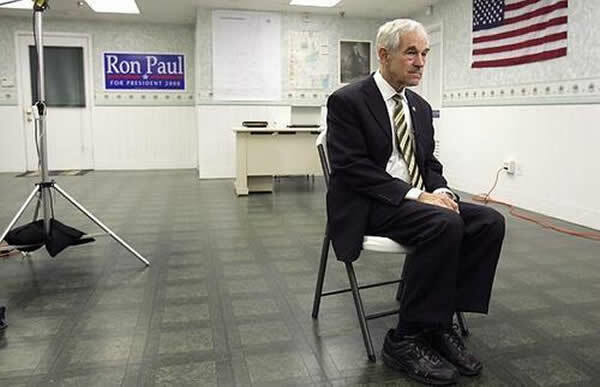 It is not about me saying that Ron Paul, whom I would endorse, is a Tiny Tim figure who is starving. It’s about saying that I am not using my vote to endorse an evil because I can use it towards my desired means, but rather to speak for what should be. I am not voting for the man I think will win, but for the one I think should. If you disagree, I will not say this means you wish to give apples to stuffed bullies over starving victims. I’ll just wonder what they put in your cider. I have illustrated my rationale for choosing a “third way”, and specified that way as choosing Ron Paul. I will next begin to address specific constitutional and philosophical reasons. I will look at issues. In this way I hope to persuade some of you to think about where you will cast your apples. I don’t think Ron Paul is a Messiah. There are things I disagree with him about. I don’t trust capitalism as much as he does. I don’t believe all the conspiracy theories a lot of Paul fans believe. And I also don’t think that liberty as envisioned by the Enlightenment and the French revolution is anything to kill over, which means I reject the war that led to the birth of the US. I’m making my choice out of what I believe is a proper balance of pragmatics and ideals. I just want to plant a seed. Maybe do a little watering too. The best change has always been grassroots. For a further reading on how to look beyond parties and voting, you can read “Christians Engaged in Society and Politics?” from the blog Kingdom Seeking. This entry was posted in Faith, Polity and tagged bullies, convention, election, idealism, issues, lesser evil, Paulbots, policies, prafmatism, Ron Paul, voting. Bookmark the permalink. Awesome article! Thanks for exposing the illogical thoughts behind voting for the lesser evil. I’m surprised you shared the video in the first link because it goes against your point in this post. haha. Your list of presuppositions are great! However, I don’t understand #5. According to the video I mentioned, the presupposition’s math would be correct. For some good satire about “when all else fails, blame the Paulbots”, watch this video. Your analogy with the three boys and the apple is very, very good and applicable! Well, I shared the video in the link because it critiques the whole system. Obviously Ron Paul is not likely to win mathematically, but the math is wrong if you say voting for Paul gives a vote to another candidate. It is mathematically ineffective, but in a very literal and real sense you are not giving anyone a vote but Ron Paul. Mathematically, he is getting a vote. The argument is that you are not. It goes back to the apple illustration. Also, this girl talks just like a girl Ron Paul.